From research on the hot hand to the observation that people don’t create enough streaks when instructed to create pseudo random data, the decision science community is pretty interested in the perception of streaks. 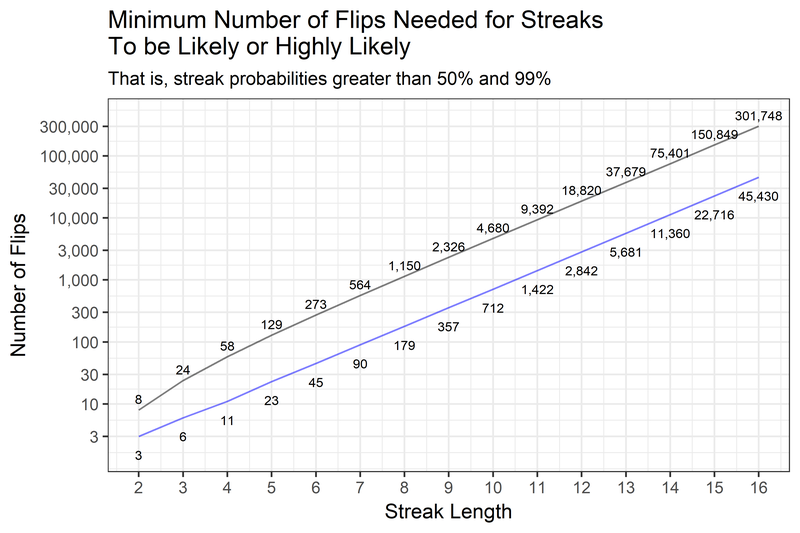 One day we got to wonder, how long would you have to flip a coin for it to be more likely than not you would see a streak of length 10? 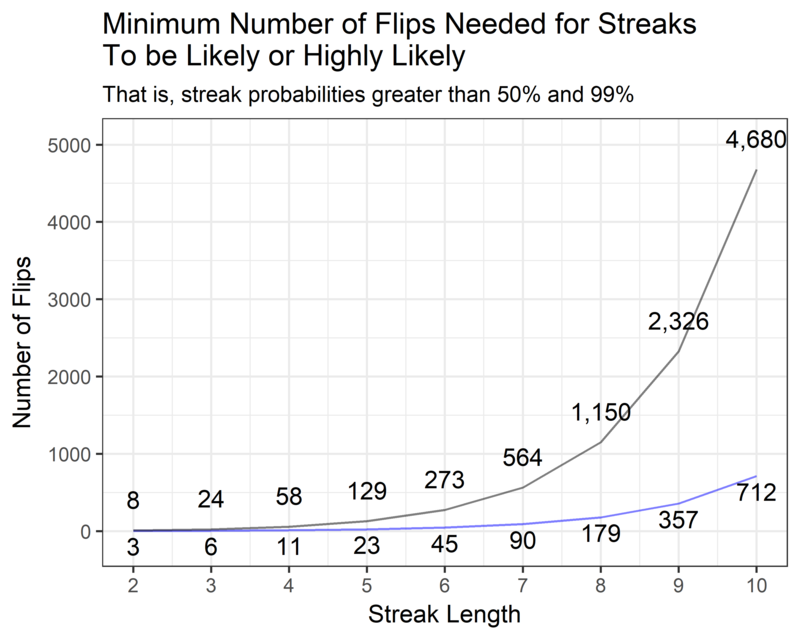 And in this thought experiment, we mean a fair coin and that the streak could be one of heads or one of tails, and finally that more likely than not means greater than 50% likely. We found a nice Markov chain solution to the problem and figured out the answer for streaks from length 2 to 16. The above graph has the first 10. 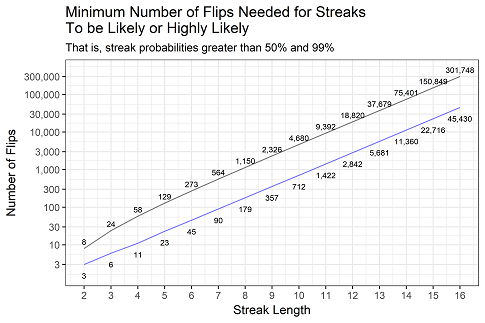 The answer is that you need to flip 712 times to exceed a 50% chance of observing a streak of length 10. 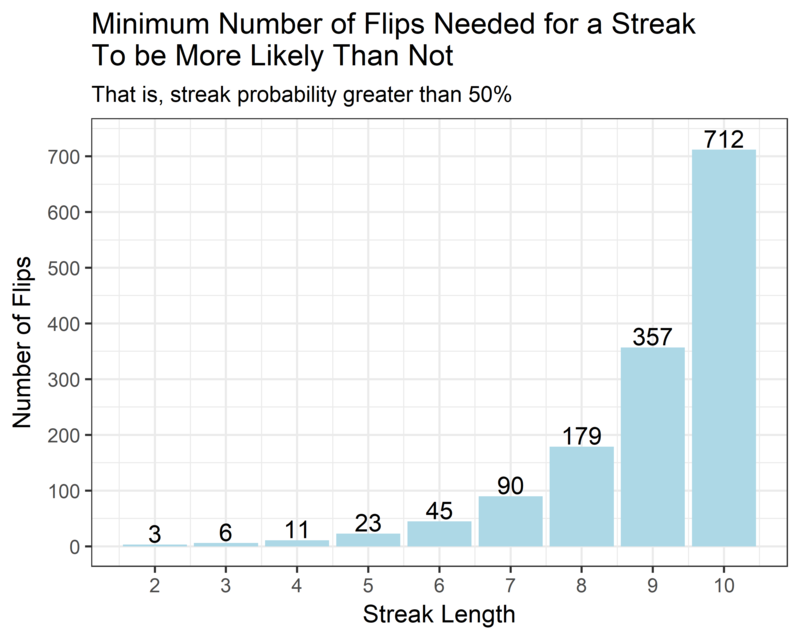 Next we wanted to see how the number of flips would grow if we wanted to be highly likely of seeing a streak, where highly likely means greater than 99%. Lastly, we took the results out to 16 flips and plotted the result on a log axis. Here’s R code to mess around with. The Markov chain but could be sped up a lot by starting the search closer to the likely crossover point. Nice post. There are other ways to formulate the logic though from strict unconditional to conditional expectations. Unconditional expectations do not confirm the existence of “hot hands,” whereas conditional logic does. In other words, given a success, what is the likelihood that the next event will also be a success? Gelman posted on this a year or two ago based on a paper by Miller and Sanjuro, “Is it a Fallacy to Believe in the Hot Hand in the NBA Three-Point Contest?” (ungated copy here … http://www.igier.unibocconi.it/files/548.pdf). 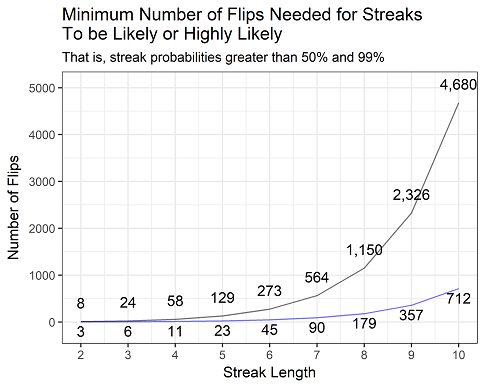 How long do you need to flip a coin to see a streak? was written on October 25, 2017 and filed in Encyclopedia,Ideas,R.